Biodiversity is easily understood as the variety of life, an abstract concept measuring the richness of life by its variety. Variety is nature's way to create stability with maximum adaptability. As humans encroach, while altering their surroundings, wildlife disappears at a frightening rate, diminishing biodiversity. What is biodiversity? How is biodiversity measured? How is biodiversity threatened? What are ecosystem services? Can we save the environment? Can we prevent extinctions? What is biosecurity? How do we protect biodiversity? Biodiversity is the natural biological capital of the Earth. biodiversity Biodiversity, the variety of life is at stake as the living space for the remaining ten million species becomes crowded out by humans. This chapter explains what is involved in biodiversity. Benefit to humans, what is not biodiversity, the species, the mechanics of evolution, nature's master plan, succession and climax, hot spots. ecosystem services Ultimately, humans depend on the services provided by the natural ecosystems, and these are critical to the life of all creatures on Earth. extinction Extinction is forever. What are its major causes? Classification of endangered species. How many species? Extinction is frightening. The mathematics of scarcity. measuring diversity Scientists have made enormous progress in cataloguing the planet's species but they are not even half way there. In the meantime, they have also become better at estimating how many species remain unknown, and how many species must have disappeared recently. Diversity and area size. Factors affecting island reserves. marine biodiversity The sea is a totally different place. How does it differ from the land? How many phyla and species? How does it affect marine reserves? How can marine reserves fail? biosecurity Safeguarding the life of native species, crops and livestock against the onslaught of introduced species and disease. protecting biodiversity Endangered species are listed in CITES and Red Data Books. Internet links biodiversity links: Tufts University biodiversity links, very extensive and academic, by category. www.redlist.org: the IUCN red list of threatened species has for almost four decades been assessing the conservation status of species, subspecies, varieties and even selected sub-populations on a global scale in order to highlight taxa threatened with extinction, and therefore promote their conservation. www.gbif.org: Global Biodiversity Information Facility, aims to become a complete store of all species information. Established in 2001.
www.iene.info: The Infra Eco Network Europe (IENE) project aims to reduce the environmental impact of infrastructure networks like roads, and conserve biodiversity through research. www.creo.org: CREO Committee on Recently Extinct Organisms. American Museum of Natural History. The word biodiversity has entered the vocabulary of politicians and conservationists as a new buzz-word, still missing from most dictionaries before 1995. It is a maligned word in the sense that conservation of biodiversity is a recently introduced concept which extends conservation from the traditional saving for future human use to the tacit admission that conservation must extend to living organisms not of any use to humans. This just stops short of admitting that those other ten million species have a right to live on this planet. Biodiversity is a better word than biological diversity, which literally means variety in the knowledge of life. The Convention on Biological Diversity (1992) defines biodiversity as: the variability among living organisms from all sources, including terrestrial, marine and other aquatic ecosystems and the ecological complexes of which they are part; this includes diversity within species, between species and of ecosystems. Biodiversity is an abstract concept. One cannot touch or feel biodiversity, as one can see a habitat or species. It is not a resource, yet it has resource-like benefits. It is often used as a feel-good word, suggesting that people know what it really involves. So what is behind biodiversity? genetic resources: enabling us to cross wild species with food or flower species to obtain improved varieties and hybrids. ecosystem services: providing fresh air, cleansing the water, recycling our wastes, etc. See chapter below. tourism and recreation: people like to visit natural places as these become rarer. Seeing rare species can bring in money. Although it is true that humans benefit from the biodiversity around them, conservation of biodiversity is all about stewardship of this planet and keeping it in a form which is still recognisably Planet Earth. If nature can be defined as what is not human or human made, then in order to preserve the integrity of the planet, no more than one third should be used or altered by people. However, as it stands today (2001), humans have already taken over half of the photosynthetic productivity of the planet, while changing over 60% of the land, and their population is still to double. Amazing biodiversity facts In 1993, about 80% of the 150 top prescription drugs used int he USA were synthetic compounds modelled on natural products, semi-synthetic compounds derived from natural products or in a few cases natural products. In 1988 ecotourism had 235 million people taking part, resulting in economic ativity amounting to US$ 233 billion. Of the estimated 320,000 vascular plant species, about 25% have edible properties but only about 3000 are regularly used for food. Only about 30 of the 50,000 vertebrate species have been domesticated. Only about 200 species of fish, shellfish, frogs, turtles and algae are grown for food or other products. Many native grasslands do no longer exist in their natural form. Forests and woodlands have decreased 15%. Tropical rain forest is being lost at 1% per year, since 1970. Natural extinction rate (background extinction) is 1-3 species per year. Human-induced species decline is 1000 times larger. Natural mammals extinction rate is 1 per century. Source: UNEP Global Biodiversity Assessment 1995.
keeping a species DNA data bank: by keeping some tissue samples containing an organism's DNA, the organism may be reconstructed at some later date, when the technology for doing so, is ready. However, no living organism has been resuscitated this way yet, and it remains doubtful if it can be done at all. Even if this were possible, the reconstructed organism must be raised in an environment which is suitable for its survival, complete with the right food and shelter and so on. Thus all the organisms around it need to be reconstructed similarly, and in the right numbers; then released in the right physical environment. Clearly, this option cannot be given any credence. keeping seed banks: seed banks are already being kept successfully of cultivars which have not been brought to production. Also the seeds of various wild plants are maintained this way. These systems work, because the species concerned are all crops for cultivation, not for preserving or creating wild environments. planting parks full of different species: although this may be pleasant to the eye, it does not constitute a natural environment, where species depend on one another, being grazed and predated upon by others, while maintaining their own populations. Parks need maintenance by humans such as trimming the trees and mowing the grass and culling deer. Most parks contain exotic species, which do not really belong there. zoos with varied animals: although a large variation in animals may assist in education, the numbers a zoo maintains, has no bearing to those found in nature. All animals live in separate pens, and do not maintain natural habitats. Zoos specialise only in spectacular and large animals, not in those essential to natural environments, like insects, worms, bacteria and so on. captive breeding: it is claimed that zoos are playing an important role in captive breeding of endangered species, and indeed they pay much attention to the genetic variability in the animals they rear. However, captive breeding is very expensive and does not lead to lasting solutions. It also focuses on only a few large species. Their numbers will never add up to a functionally living community, and releasing them back into the wild is questionable. reintroducing native species: by reintroducing native species into protected areas, it is hoped that their survival is enhanced. Indeed some successes have been scored, but all too often, the effort does not in any way affect a species' precarious state. Often the habitat or climate of the protected area proves to be unsuitable, and introduced species do not breed. However, almost-extinct plant species have been cultivated and spread all over the world, where they now live successfully in home gardens and parks. introducing alien species: by introducing alien species, one enhances biodiversity, it is thought. However, these species are competing with the native ones, displacing these and causing extinctions in others through predation and competition. In the end, every garden variety is a potential invading species. Many plant and animal species, once thought harmless, have turned into aggressive invaders. creating new species: new species can be created by breeding, cross-pollination, hybridisation, and genetic engineering. However, such species need a long period of testing whether they are suitable for the environment in which they are introduced. Most likely, they will upset an existing balance, or die. However, GE for crops is more predictable in its outcomes. habitat restoration: by planting shrubs and trees, people hope to restore habitats that were once lost. However, such plantings have very little chance of being in the right place, quantities, species and timing. As a result, unbalanced communities are made, not resembling a wild environment at all. They remain man-made parks. feeding wildlife: by feeding wildlife, it is hoped that more will survive. However, it causes wild animals to congregate to feed lots, causing unnatural tracks and erosion. It draws them to the places where diseases originate from human domesticated animals. Occurring in dense concentrations, the wildlife is more likely to spread contagious diseases. It is above all, an unnatural situation. The message here is that the best way of conservation is prevention of degradation of proven natural ecosystems and habitats, with all their species. By preventing habitats from being changed, the largest contribution to conservation can be made at the least cost. An often overlooked fact is the soil, as perhaps the most important part of a habitat or ecosystem. To preserve an ecosystem, means above all, preserving its soil. See our chapter about soil. species (L: specere= to look; species= appearance, beauty, kind) a class of things having some common characteristics. A category in the classification of living organisms consisting of single individuals capable of exchanging genes or capable of inbreeding. Although the above definition appears simple enough, in practice, it is difficult to tell species apart. morphological species concept (MSC): species differ if they have different form. However, some species have richly varied forms. In some species, males and females look entirely different. Other species have many colour forms (like flowers). biological species concept (BSC): species differ if they cannot interbreed. However, many distinct species do interbreed, but their offspring is less successful, sometimes sterile. Often species who could interbreed, are prevented from doing so, because they are isolated from one another. DNA species concept (DSC): species are distinguished by the differences in their DNA. However, some very distinct species have only very small differences in their DNA. (Human and bonobo chimpansee DNA differ only by 0.013). This method is also used to quantify genetic diversity within a species. However, many invertebrate species and plants reproduce mainly asexually. sibling species: even though species look alike, they do not interbreed and are truly separate species. hybrid species: species can be crossed to produce a new species, which is often sterile. If hybrids between two similar species cannot be found in the wild, they must be biologically separate species. But when similar species are geographically separated, this becomes difficult to establish. All breeds of domestic dog can interbreed to produce fertile offspring. It is estimated that up to 10% of all species hybridise in nature. bacteria: single-celled organisms have different means of reproduction. Viruses play an important role, being able to transmit genetic material from one organism to another. When examining a soil sample, one may visually distinguish a hundred different bacterium species, but DNA techniques applied to the entire sample, find a hundred times more. Are these truly different species? If so, the species diversity of bacteria alone eclipses all others, estimated at 70 million species. Although it may be difficult to define precisely what is a species, nature has a specific place and function for each. chance: breeding and (sexual) multiplication causes an exchange of genes, by which offspring are not identical to their parents. As a result, variety is created, as individuals have different properties. If their properties are more suitable, they will survive better. competition: every organisms has the capacity of producing more offspring than strictly needed. Survival is dictated by competition for food, for space, for partners and so on, which is in effect a daily test of suitability. functionality: nutrients and energy are the most precious commodities (tradable items) of an ecosystem. Those species able to recycle these commodities, while living frugally from them, have a better chance of surviving. It appears as if species co-operate as groups, while competing as individuals. habitat change: every species has an influence on its habitat, by the simple reason that it lives from what the habitat provides. As species or their numbers change, so does their habitat, including physical qualities such as soil, slope and landscape. isolation: when one group of a species is isolated from another (and with it many other species, like on an island), its gene pool develops in its own direction (and so do all other species, interacting together). The slightest difference in environmental conditions will then lead to a community of new species. time: genetic changes happen slowly from generation to generation, sometimes accelerated by sudden environmental changes. Evolution takes an enormous amount of time. It is hard to imagine that the sheer variety and beautiful functionality of the 4-30 million species around us, has arisen from such simple strategies as listed above. But it is the unimaginably vast period of time, and the equally unimaginable number of extinct species, that make it seem purposeful, as if a creator were behind it. Although we perceive only the successful species alive today, evolution consists of a long path of failed species. Of all the species that have ever lived, 99.99% are now extinct! those on the way in: new species with improved traits (characteristics), moving to out-compete old species, upsetting the balance of nature until a large number of other species have adapted to the new situation. The number of species of this kind are very few, but where humans have disturbed an original habitat, while at the same time introducing new species from other places of the world, a major shift in biodiversity occurs. those in stable relationships: the majority of species is in a stable and functional relationship with the other species of the same ecosystem. Generalist species live over a wide range and may have various functions. Specialist species have a narrow range and function; they also have less genetic variation. common species: the main players in the functionality of ecosystems, forming the main guilds of producers, grazers, predators, scavengers and decomposers. Many other species depend on them, reason why they are also called keystone species. A drastic change in the number of a keystone species ripples through the fabric of the ecosystem, causing drastic changes everywhere. In the sea, many keystone species are overfished by us, leading to unforeseen change. rare species: species which maintain themselves in small numbers, using the existing ecosystems and their services, while not depending for their food on any specific species. They could also be on the way out to extinction. commensal species: species living on or with another species but not affecting that species. mutual species: species living together while benefiting each other. parasitic species: species living from a host species. those on the way out: species which have been displaced by new species, which are 'fitter' for their environment. Few species fall in this category, although the spread and multiplication of humans, has displaced many species, which have proved to be 'unfit' to live in a smaller space, together with humans. The loss of species which have already declined to small numbers, is usually insignificant. Whereas the common species are the most important from a food and functional perspective, the rare ones are the most fascinating. Somehow they have managed to stay alive in small numbers, living far apart, as if flouting the laws of nature. In many cases such organisms have developed advantages (technology) such as camouflage, special defences, being inedible, being poisonous, being able to survive long periods of adversity (famine, cold, drought, etc.) and so on. Surprisingly too, they appear to survive well, individually to an old age, and as a species. 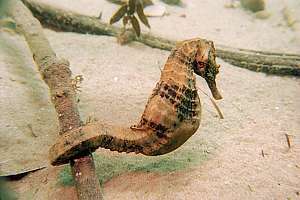 f003929: a pregnant male seahorse (Hippocampus abdominalis) hangs on to a branch in the tidal current of an estuary in New Zealand. Seahorses have evolved a peculiar way of reproduction. The female lays her eggs into the male's pouch after an affectionate courtship. Inside the pouch they are fertilised. Each egg then attaches to the pouch's lining, drawing food from the father and developing into a tiny seahorse. At 20mm length, the 50-200 young detach and escape to live entirely on their own resources. f023214: A male long-tailed stingray (Dasyatis thetidis) tolerates a diver touching his wings. Poor Knights Islands, New Zealand. 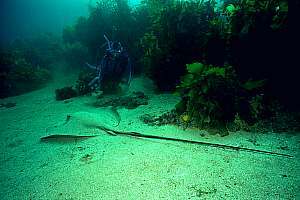 Stingrays and sharks, considered primitive cartilagious fishes, have evolved a system of internal fertilisation. Males have two penises (claspers), as seen trailing behind the animal above. Females give live birth to two baby stingrays, which are entirely functional and capable of looking after themselves, after birth. These are two examples of nature's way of reinventing the wheel in different ways. genetic diversity: the variety in the genome. individual diversity: the variety of genes present in the members of a species, as visible in size, shape and colour, but also by invisible differences, like enzymes capable of metabolising specific substances. species diversity, the most familiar type of biodiversity, refers to the variety of species in a specific place or among a specific group of organisms. bodyplan diversity (taxonomic diversity): the variety in phyla, offering various body plans, particularly in the oceans. size diversity: the right size for the right job. ecological diversity: the variety of ways organisms live together, producing visibly different habitats. ecosystem diversity refers to the variety of physical settings on earth, such as forests, deserts, lakes, and coral reefs, and their populations of plants and animals. habitat diversity: the variety of biological communities within larger ecosystems and biomes. functional diversity: the variety of functions, trophic levels, guilds and others to make an ecosystem work. Size diversity is an important aspect of this too. physical diversity: the variety in climatic areas, biomes, geology and so on. Although not directly part of the living stock, these factors have nonetheless a profound influence on biodiversity. In general, the higher the temperature and the more moisture, the more productive and diverse life is (biodiversity). temperature: the surface of the earth curves away from the equator. Less sunlight reaches the surface as one travels to the poles. It makes the poles cold and the equator warm. The amount of radiation changes gradually, but temperature depends also on moisture. seasons: the earth rotates on a 23.5º angle with the sun, causing the seasons. Over the equator, seasons do not change in temperature, but over the poles they do so most. Seasons affect the delivery of light, warmth and moisture. rainfall: due to the rotation of the Earth, rain does not fall equitably everywhere. Most rain falls over the tropics. Two desert bands extend north and south of it. From there to the poles, rain increases, then decreases again. In the centres of large continents, exist desert areas where the rain, originating from the oceans, does not penetrate. evaporation: (potential) evaporation increases rapidly with temperature. At the poles it is very low, but over the equator it is high, and it changes gradually between these extremes. The amount of evaporation powers plant metabolism but the amount of water available depends on the difference between rainfall and evaporation. Their combined effect is crucial to plant life. soil: the quality of soil affects the plants that grow there, but plants in turn affect the quality of the soil. In the end, soil quality is determined entirely by the factors mentioned above, and to some extent by the local geology. local conditions: within the global ecosystems, an enormous variety of conditions prevails, affecting biodiversity. The local physical conditions mentioned below, affect one another locally. For instance, moisture and temperature promote plant growth, which affects shelter, which affects temperature and moisture, and so on. The local topology (land form) is also of enormous importance. Mountains become cooler and windier at height. Behind mountains shelter is found and desert conditions. Before mountains rainfall and wet forests. River valleys and wetlands create their own microclimates. moisture: moisture is collected on leaves, in the soil, in the subsoil and aquifers. wind: wind can damage plants, lower the temperature, and reduce moisture. slope: the slope of the land makes soil erode more quickly, resulting in poor soils uphill, and it causes water to drain more quickly, causing drier conditions uphill. The slope is decisive on what lives where. aspect (angle facing the sun): the aspect of a slope is also important. Shaded slopes are moist, promoting ferns and shade loving plants, whereas sunlit slopes are dry, promoting drought resistant plants. substrate: the local geology can change in rapid ways. Volcanoes can interrupt the landscape, and with their fertile soils introduce different species. Geological faults may thrust sedimentary layers upward, changing the way water drains. The sub soil may consist of sediments or hard rock. Minerals may enrich or pollute the environment. The substrate may provide niches for shelter for animals, and so on. In the above summary of biodiversity, the physical world has been included with the living world, which is not usually done. However, the physical environment has a major influence on biodiversity, and the living and nonliving worlds interact in such profound ways, that it is not possible to separate them. Rainfall and evapotranspiration are the two most important factors to life, as shown in the diagram on right (but notice the logarithmic horizontal evapotranspiration and vertical growth scales). An increase in evapotranspiration of 10x leads to an increase in productivity of 40x. Life in turn, is of influence to rainfall, stabilises the world's climate, has made the world suitable for life, has formed the oceans, and who knows may also be accountable for the drifting of continents on their tectonic plates? In the grand scheme of things, it is important to distinguish what comes first. Since all animal life depends on plants, plants must take up the largest biomass, by at least five times. Because plants are able to store energy in woody tissues, which resist being eaten to some extent, their biomass can be very much larger still. Once the plants have established themselves, wildlife follows. It is not a stable situation, since plants create soil, with the help of soil animals, fungi and bacteria. As the soil changes, other plants take hold in succession, as do animals and soil creatures. Eventually a relatively stable climax vegetation forms, in which nutrients and energy cycle optimally, with minimal loss, but with very low net productivity (growth). Its total biomass then stays constant, and it won't be able to sequester additional carbondioxide from the air, for lack of moisture or nutrients. In such climax forests, with all their variants and edges, the highest diversity of species is found. Soil development: progressive development of the soil, with increasing depth and organic content, and differentiation of layers or horizons. Increasing biomass: increasing height and massiveness of the plants, while also differentiating the strata or tiers of vegetation. Storing nutrients & energy: the pool of nutrients and energy held in plant tissues, animals and soil, increases. Increased productivity: productivity, the rate of formation of organic matter increases. Microclimate: the microclimate under the canopy becomes determined by the forest, and increases in importance. Increased biodiversity: species diversity increases from simple succession communities to mature climax communities. Equilibrium: populations rise and fall, replacing one another until an equilibrium is reached. Long-lived species: long-lived species begin to dominate. Stability: the relative stability of the communities increases. Biodiversity climaxes. At present, ecologists are a bit confused about the climax idea. They observe that fires can take down the work of hundreds of years of development, which makes them think that the situation is more dynamic (subject to change). Indeed many ecosystems are subjected to periodic upheavals such as hurricanes and fires, but the climax idea still holds as it is related to the amount of biodiversity information still available in soils, seeds and structure needed to rebuild the whole. Note that the climax idea and stability lie at the heart of resilience or the capacity of an ecosystem to rebuild to its original state after an upheaval. When a change becomes permanent, this could only mean that environmental conditions have changed and/or biodiversity information has been lost permanently. The uneven distribution of species in their environment causes what scientists call clumping. Clumping may have been caused by sheer coincidence of chance effects. When emptying a bag of red and blue marbles, one will notice that they are not evenly spread over the floor, but in some places the reds are dominant, whereas in other places the blues. However, these are not what scientists call hot spots. moisture: since moisture is the most important need for life, the reliable availability of moisture, causes local hot spots. Such moisture may be provided by a small lake, a spring or water resurgence, a wetland. A groundwater forest may arise in an arid climate where groundwater seeps upward from an impregnable layer of angled rock (artesian water). shelter: valleys surrounded by hills or mountains, may enjoy year-round shelter, promoting tall trees, which trap moisture, thus creating a hot spot. Under water, a hot spot forms near underwater caves, which give protection to many species, and which are a safe place to sleep. When such a place is found near currents, which bring food, the hot spot becomes very rich indeed. fire: some spots have systematically been missed by burns and natural fires. As a result, the old climax vegetation still stands, and around it a gradient of succession species, inviting a large number of species in a small area. In other places, sporadic fires are able to cull fast-growing species, which may suppress all others. In doing so, fires can enhance biodiversity. ice age: during an ice age, the land becomes covered with a moving ice sheet, which destroys all life by its sheer pressure and because it moves. It removes the soil too. But some places remain exempt for various reasons, retaining their soils and some vegetation. After the ice sheet has retreated, such spots have a lasting advantage over others, becoming rich hot spots. multiple habitats: where different habitats intersect, the species associated with each, meet and interact. It is a place with all the species of all the habitats. local disturbance: a local disturbance like a soil slip may introduce succession in the heart of a climax forest, introducing with it succession species. A soil slip also loosens the earth, while making nutrients available. Some slips are very large (slumps). One could easily make the mistake that hotspots should be protected for their biodiversity, and that they give the most value for the least size. It is true that hot spots have proved their resilience over time. However, conservation is about creating sustainable communities, large enough to enable interbreeding while also maintaining a varied gene pool. Size thus remains important. In our observations of the underwater damage caused by Cyclone Heta in January 2004, we noticed that much of the damage was caused by individuals and communities being scattered around. After 18 months, the animals found one another again and regrouped, which caused distinct clumping of biodiversity. On a small island surrounded by a large empty blue ocean, with little food to sustain high biodensities, clumping (schooling or grouping) is an important mechanism to form viable and fecund communities where high biodiversity exists all around. When diving in such an environment, every dive discovers a number of species not seen before, and these remain specific to the dive spot. By diving in different places, one also meets different communities, as if Noah's Ark was spread out all along the shore. Over a very long period of time, the life on this planet created an environment suitable for innumerable species and humans. Around us we see nature as a benign place to be, replete (filled) with rich food sources. It is by far, a friendly place, a place we call home. We have given ourselves the right to plunder this home, and to change it to our needs. With the help of technology and fossil fuel we now believe that we have become invincible rulers of planet Earth, but nothing could be further from the truth. Like all other creatures, we depend on the life supporting biosphere, which is maintained by the co-operative effort of millions of species other than Homo sapiens. They provide services that humans cannot even think of providing for themselves, services which maintain the biosphere in a state supportive of all forms of life, including human life. water cycle: water evaporates mainly as a function of temperature, and mainly above the oceans because these are so large. Winds transport water vapour. Rains fall and water returns to the oceans. Our crops need reliable supplies of water. precipitation: planktonic organisms produce the condensation nuclei (dimethylsulfide, CH3.S.CH3) which promote cloud formation. Cool areas (forests, mountains) invite clouds to precipitate as rains. watershed regulation: forests, with their enormous surface area and spongy soils, buffer vast amounts of water, to be evaporated gradually or seeped down-hill to springs and creeks. Plants, particularly trees, play an important role in regulating the water supply. water purification: the process of evaporation is like distillation, lifting pure water from the land or oceans, while leaving salts behind. The water cycle acts like a gigantic (and free) water purifier. Rainwater is perfect for drinking and irrigating. irrigation: water from the sky is the best irrigation one can get. Even when cropland is irrigated with river, lake or ground water, natural rain must always exceed the artificial quantities applied, for it to be sustainable, thus avoiding salinisation (salting up). recycling/ cleansing: the clean rain water cleanses the soil from excessive salts, thereby increasing its fertility. Myriad small organisms work together to break down wastes and dead organisms, so that their nutrients are recycled. CO2: carbondioxide is reassimilated by plants and turned into food for animals. natural wastes: are broken down and their energy used in the process. The resulting nutrients become available to plants. industrial wastes: nature can neutralise and detoxify some industrial wastes, converting them to harmless components. mineral wastes: waste from mining can be poisonous, but nature is capable of stabilising it so that its release becomes slow and gradual. stabilisation: the many creatures forming ecosystems, stabilise their environment. The Earth, acting like a single creature, regulates its overall temperature by cloud formation and greenhouse gases. climate: the world's climate is stabilised by cloud formation, and local climate is stabilised by the presence of water, since evaporation absorbs enormous quantities of heat, while keeping temperature constant. rainfall: plants create a porous soil, storing rain water. As they grow, plants evaporate moisture, which rises, condenses into clouds, only to rain down again further inland. They influence rainfall elsewhere, and by cooling the surface, also attract rainfall. soil fertility: the fertility of soils is maintained by thousands of soil species, living in balance with the plants and animals above ground. pests: in a balanced environment, pests are unlikely to grow out of proportion, as they do on monoculture cropland. Every pest animal has its natural predator. Pest plants have their natural grazers. protection: the natural environment protects us from various kind of harm. radiation: radiation from the sun is shielded by gases produced by organisms. Ozone is formed from oxygen by ultraviolet radiation, and protects life this way. Water vapour forms an effective filter too. soil: plant roots bind the soil, preventing erosion, while their leaves prevent rain drops from hitting the soil and eroding it. Trees and shrubs shelter the soil from winds that could blow it away. coastal zone: living organisms growing over the rocks in the coastal zone protect it from erosion by waves. nursing grounds: trees and shrubs provide shelter to many organisms and their young. In the coastal zone mangrove roots provide sheltering habitat for juvenile fish. barrier reefs: coral reefs function as barriers against storm waves, thus protecting islands and settlements. supporting variety: by supporting a vast variety of species, the environment adapts slowly to new situations. By accommodating a vast number of individuals, environments can adapt quickly. Both are cases of overcapacity. adapting to environmental changes: fortunately for us and other species, the environment has the ability to adapt to new situations such as global climate change, although many a species may be lost in the process. The changes humans have brought about are of global magnitude: greenhouse gases, ozone depletion, acid rain, droughts and more. adapting to times of adversity: all species tolerate a range of living conditions. They don't die immediately in case of drought or food shortage or natural disaster, and when they do, they can quickly rebound from aestivation or hibernation, or reproduce from spores and seeds. adapting to new pests: whenever disease strikes human crops, some plants appear resistant. These can then be bred to form new pest-resistant varieties. products and services: products we use direct from the source. pollination of plants: pollination of fruit-bearing plants like tomatoes, kiwifruit, apples, pears, etc. pharmaceuticals: natural farmaceuticals for natural healing, but also toxins, quinine, agar (from seaweed), etc. genetic database: the individuals, species and ecosystems store a vast wealth of genetic information, which defines planet Earth. It is also a main source for plant breeding, particularly for our crop species. The crop varieties found in the wild do not produce large crops, but they may contain genes that give them protection from leaf eating insects, root rot and other diseases. Such genes can be transferred to productive crop species to make them even more productive. Because such genes have been 'tested' by nature, the risk of using them, is minimal. This map shows the genetic hot spots where our major crop species come from, and where their wild varieties are found. These wild species and varieties are important for sustaining the crops' genetic resource base, because our main crops have the tendency to be monocultures of the most successful hybrid varieties only. Unfortunately, these hot spots are also good for cropping, which displaces the wild varieties. A concerted effort must be made to retain the genetic database and their natural habitats. When living in an artificial environment like a city, with piped water, waste and energy, it is easy to forget that we depend on the part of the planet we have not changed. That part, already less than 50%, is shrinking rapidly. Intergalactic space travel? Spurred by our rich imagination, many people have started to believe in the reality of space travel across galaxies to planets with environmental conditions like ours. We could produce our own food from unlimited sources of energy and we could live longer in suspended animation. Human life is just the blooming stage of Gaia, ready to spread its seeds. Intelligence will provide the vehicles to seed life to other planets and other galaxies. Even if Earth may no longer be inhabitable, life and the human species will survive elsewhere. However, this may never be the case. Observant scientists have pointed out that Earth is a young planet, and our galaxy also. Much older systems exist in space, many millions of years older. Life must have evolved there to bear intelligence incomparably superior to ours. Life-carrying planets should be within a reachable distance, and a thousand years to hop from one outpost to another must be easy for an advanced intelligence. In the millions of years of advantage, they could have seeded every planet in the entire universe, including Earth, long before the advent of Homo sapiens.Yet they have never found us. We are insufficiently aware that all life on this planet depends on each other; that every species depends on hundreds, perhaps thousands of other species in an invisible network of ecological relationships, from which no species can be removed without an effect on others. Worse still, no species can live outside this network, and so does Man. No species alive today can live on some other world; not even on Earth 100 million years ago or 100 million years in the future, because those are different worlds with different climates and species and ecological relationships. There is no hope to seed life somewhere else. There won't be any planet with an ocean but without life. There is perhaps no planet at all with an ocean. To bring a library of DNA, hoping to rebuild the species from Earth, is flawed because the planet where they came from was created in 4000 million years by myriad successions of other species. The planet where they are introduced is not. let's be humble and save this one and only Earth.